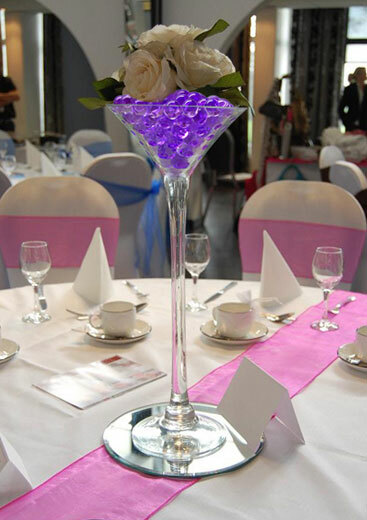 Do you take Water Beads to be your beautiful wedding table decoration? (Say it! Say "I Do!") How could you resist such a stunningly simple and fun yet elegant alternative to a bowl of rocks and twigs? All it takes is a simple bowl, vase or glass filled with water beads in your theme colours garnished with your wedding flora. Dry flowers, fresh flowers, greenery or even a candle will complement your wedding theme and will possibly be the most cost effective part of the whole event! You can order as little as 10 packets for just $10 so we're not kidding about how cost effective this really is! One packet makes about 600ml, so do a quick calculation and work out how many packets you need. Be sure to get just a little more than you think just to be safe. Don't worry about any staining guests clothing or table cloths. Unlike many other water beads on the market, ours are guaranteed colourfast. We recommend our new Pearl Water Beads as they have a unique soft glittery appearance which looks stunning and elegant for practically any formal occasion. They are available in 6 great colours. Alternatively, our Regular Water Beads are transparent and come in a broader range of colours. Why not give each guest a packet of dry water beads to take home. It will make a great bonbonniere and allow them to fill a little bowl to remind them of the perfect reception. We can customise labels for the packets to include the newlyweds names and a custom message.